Entrepreneurship is often likened to a journey: the route from concept to success being long, sometimes circuitous and frequently arduous. A good deal has been written in the media, press and business literature about the stages of entrepreneurship, the dynamics of innovation and the processes involved; as well as the values of resilience, tenacity, passion and belief. But what about real-life stories? What can we learn from the experiences of real people who have hung their ambition on a dream and given it all in the pursuit of success? In 2015 Alexander co-founded Pass the Keys, a new type of property management company, specialising in the short-let market. Pass the Keys is a simple yet unique concept. It offers a comprehensive rental management package for homeowners who want to let their properties on platforms like Airbnb. Alexander’s team takes care of the entire process: from listing the properties to proactively searching for guests, managing their stay and even cleaning up after they leave. The idea, says Alexander, is straightforward. It is also translating into success for Alexander and co-founder Zoe Vu, both graduates of the London Business School MBA. With an HQ in London and satellite offices in 10 other UK cities, Pass the Keys now lists across more than 25 platforms and is growing at a rate of 300% year over year. Spotting the potential was simple, says Alexander. Airbnb and others didn’t offer – and had no intention of offering – management services for the properties they listed. 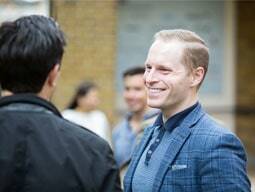 Seeing the niche and testing the concept was also simple as Alexander had access to experts, mentors and partner networks via the London Business School Incubator. From tackling the naysayers to negotiating funding, Alexander and Zoe spent the first several months struggling to figure out what their growth plan would look like. And then, they had to confront the reality of the technology itself. Starting on this journey has been a steep learning curve, says Zoe. And of course, with learning comes important lessons. First there are the people you work with. You can’t compromise on the quality of the people you hire, says Alexander. Nor can you second-guess investors. Another learning is ensuring you know your customer very well. Tahreem Arshad knows her customer very well. Her startup, Sozie, was born from addressing the needs of a very particular client: herself. Sozie is an app that connects shoppers with the same body size, shape and style so they can share opinions on clothes and earn discounts on purchases. When user A enters a Sozie-enabled store, he or she can share selfies seamlessly with users B, C, D and so on, each user earning points that translate into money off if they make the purchase. The genius of the app is that it addresses indecisiveness on the part of the shopper, while making it possible for their lookalikes (or “sozies”) to try clothes on virtually – and make the same purchase if they like the garment. It’s a win-win for users and for retailers, says Tahreem, as it has been proven to boost sales in its trials. But the journey to success has not been without its problems. Tahreem found support in the shape of a fellow female entrepreneur at the LBS incubator, with whom she could bounce ideas, test her concept or talk through issues with her team – a “buffer” for the “vulnerabilities” anyone starting up might feel. No one knows more about believing in a venture than Zipporah Gatiti. Founder of agri-tech startup, Taste of Kenya, Zipporah has taken what she learnt during her MBA at LBS and put it straight to work against steeply stacked odds in her homeland. Taste of Kenya is a direct trade social enterprise. The company links coffee farmers in Kenya to buyers all over the world, boosting local livelihood, supporting domestic consumption of coffee and promoting sustainable farming practices. The idea came to Zipporah during a visit to her grandmother’s farm in 2015 when she noticed that farmers were cutting down their coffee plants to make room for more prolific but less profitable crops. Starting up comes with its cycles of highs and lows and the lows, says Zipporah, can last longer than you expect. To make it through, you have to believe in your idea. Taste of Kenya is testimony to Zipporah’s conviction. Believe in your idea. Test it, validate it, develop it. But truly believe in it and be sure to own it. Know your “why.” Understand what motivates you and hold onto that when the going gets tough. Know your customer. Internalise their needs and build your idea around them. Don’t wait for the perfect moment. It will never come. And you might miss the opportunity while you’re waiting. Make it about people and don’t compromise on quality of people when it comes to hiring. Ensure you have the best team, the best mentors and the best support network. Remember they are your partners in building your business. Be real. With investors, with colleagues, with team members. This is a difficult journey so lose any façades. Allow your belief in your concept to shine. How you feel and communicate about your idea will influence everyone else. And that includes investors. Don’t be risk-averse. Take chances, be prepared to learn if things don’t work out. Don’t be naïve. There will be highs, but there will also be lows. And the lows can last a long time. Don’t give up. Success may not be immediate, but will taste all the sweeter when it comes.